I’ve heard many stories of associations, clubs, churches, and other nonprofits using Facebook to grow their organizations in members and revenue. Just take this story of how Free the Children used Facebook likes to raise $2.4 million for their charity. Or how Patty Foley, the Membership Chairperson of Newington Community Television uses Facebook to find new volunteers. Lower Marketing Expenses: A Facebook Page costs $0, and running ads are relatively inexpensive compared to other traditional media like print. Build Brand Loyalty: If your followers see that you're active and responsive, they'll more likely interact with you. Increase Website Traffic: Use links in posts to direct traffic back to your website. If you're still working on your nonprofit's logo, check out these 75 nonprofit logos, which can give you some ideas. 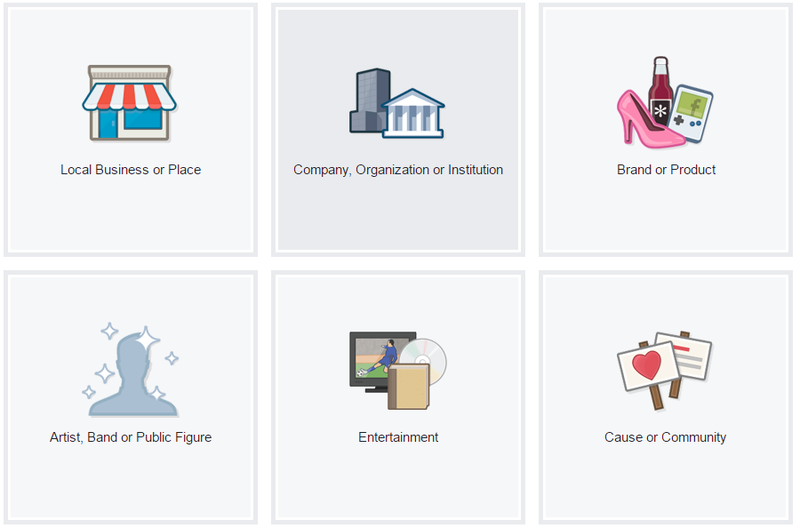 Once you have all these things, it’s time to create your Facebook Page. 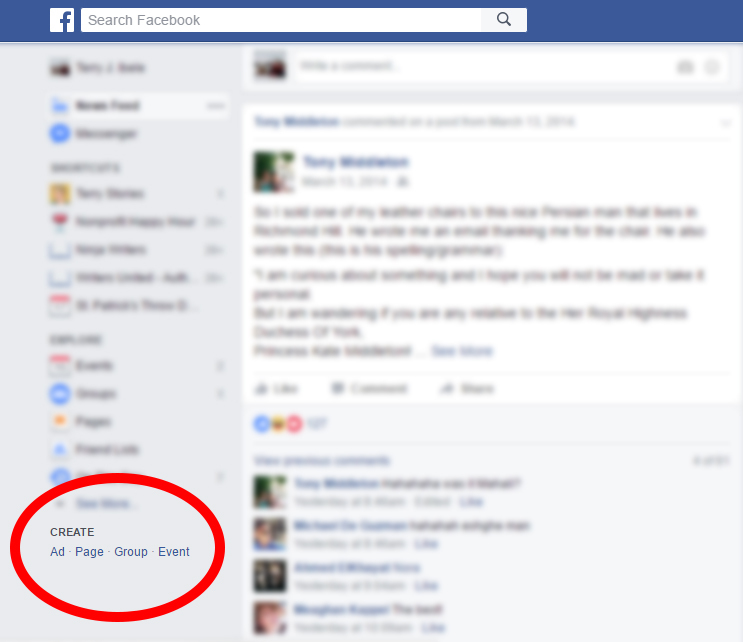 Login to your Facebook account and click “Page” located in the lower left of the screen. This will take you to the next screen, which will show six quadrants. Each indicates a different type of Page you can create. 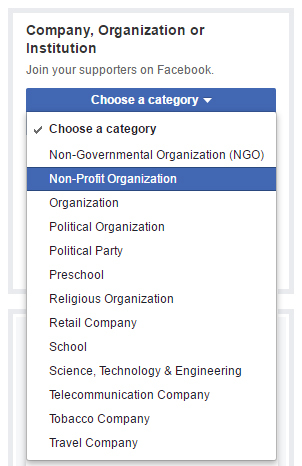 Select “Company, Organization or Institution” to create a nonprofit Page. Note: Select “Cause or Community” if you’re creating a charity. Once you click the quadrant, you’ll be asked to choose a category. Scroll down until you find, “Non-Profit Organization” and select it. After that, enter your organization’s name and click “Get Started”. If the image you upload isn’t a perfect square, it’s okay, Facebook will help you crop it. Your display image is the best place to use your organization’s logo, because this is the image that will appear in people’s Facebook feeds whenever you post something. To upload your image, simply click the box in the upper left hand corner. The higher quality and size of the picture you upload here, the better. This image is only seen if someone comes to your Facebook Page. Use this image to help give your Page some extra branding and display the culture of your organization. The American Counseling Association changed their cover photo to include information about an upcoming event. Now everyone who comes to their Facebook Page will know about their conference and the ACA will likely see a boost in event registrants. In this example, Canadian Blood Services added a CTA (call to action) on their cover photo, challenging all their Facebook visitors to become a donor. They’ve also included a website link in the image, making it easy for someone to find out more information. 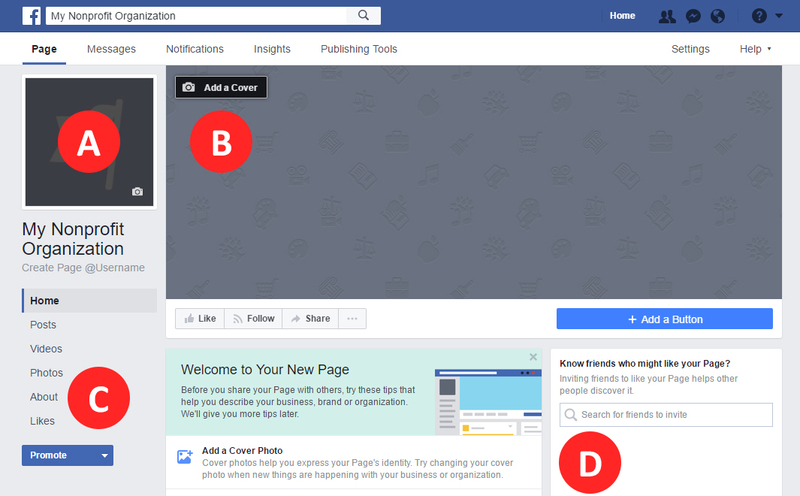 In a similar way, you can use your cover photo to ask people to join your organization and tell them where they can become a member. The people in the photo will likely share QUT’s Page with their Facebook friends, since photos have a super high interaction rate on Facebook. In turn, this will help boost member engagement with your current followers, especially those in the photo. A photo of real members lets potential members know your organization is personable, inviting, and most importantly, that your organization cares about its members. If you have some photo-editing skills, and want some tips on how to create a super eye-catching cover photo, check out these 11 do’s and don’t’s put together by HubSpot. Once you’re happy with how your display and cover photos look, next edit the “About” information on your Page to give people more information about who you are. To do this, click “About” on the left hand side of the screen. You’ll be taken to a Page where you can enter all the information you like about your organization. 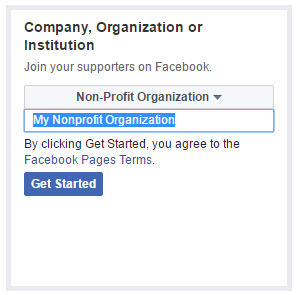 After finishing steps one through four, you’ll have a basic Facebook Page setup for your nonprofit. Now it’s time to start getting followers who will like your Page (don’t forget to like the Page yourself). Followers who like your Facebook Page will see your photos and posts in their Facebook feed whenever you have a new update. Use Facebook search to invite your Facebook friends to like the Page. This is located on the bottom right of your Page. Simply type a friend’s name and click “Invite”. These friends will receive a notification inviting them to like your Page. Email your current subscribers and members with a link to your Facebook Page and ask them to like it. You can find the link to your Facebook Page in the URL as shown below. Simple copy and paste this text into an email. Add a Facebook link to your website. It’s a good idea to place this link where your contact information is located. The most visually engaging way to do this is to make the link an image of Facebook’s logo, like how it’s shown below. Include a Facebook feed on your website’s homepage so all your website visitors can see your updates and like your Facebook Page right from your website. Here’s an example from The Webb Mountain Discover Zone. Simply scroll down their homepage to see their Facebook feed. If you want to add a Facebook feed onto your website, visit Facebook for Developers, which shows you the steps. However, you may need a little technical expertise to do this. Note: Webb Mountain Discovery Zone added their Facebook feed using Wild Apricot’s drag-and-drop website builder made for nonprofits. Once you’ve completed these simple steps, your nonprofit’s Facebook Page is ready to go. People will be able to search for your organization on Facebook and you can start engaging with your new followers right away. If you'd like to take your Facebook knowledge to the next level and learn how the experts are using Facebook to engage their members, check out our free webinar with John Haydon (author of Facebook Marketing for Dummies) on how to use Facebook to boost member engagement.